tIf there's nothing quite as bad as having high hopes for a book and having them dashed, conversely there must be nothing quite as nice as having high hopes for a book and having them fulfilled. I got my first taste of Prachett about 8 years ago when I picked up The Color of Magic, Pratchett's first Discworld novel. I was mildly entertained, but it wasn't spectacular and just didn't quite deliver, so I never really kept going with the series. 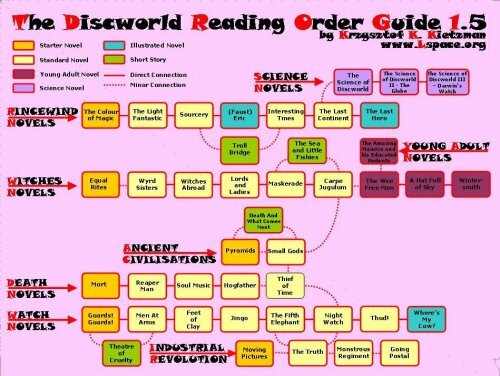 Finally after another 4 or 5 years of badgering by various individuals, I decided to give the Discworld novels a second try, this time starting with a different story thread - the Guards thread rather than the Rincewind thread. I was assured that the Guards thread is some of his best work, and that he had a few dozen books under his belt by the time he started it, so there would be no more New Writer Blunders. Guards! Guards! (I love writing out that title, I get to be so exclamatory) follows the mishaps and adventures of 4 nightwatch guardsmen who are, respectively, a Drunk, a Sleaze, a Blustery Coward, and a Definitely-Not-Long-Lost-King. When Dark Forces connive to infest the city with dragons, it's up to the aforementioned quartet to get to the bottom of the mystery. Really there's not a huge amount of story there, so I'll leave my summary at that to avoid spoilers. Basically everything about this book was spot on. It had an interesting story that at first glance seemed predictable, but then turned out not to be. It had solid entertaining characters that actually *gasp! * developed via the plot line. It had excellent, witty dialog that got quite a number of chuckles out of me, particularly as many instances struck a Monty Python-esque chord with their pacing and delivery. Finally there was a healthy dose of intrigue, good guys in black, bad guys in white, clever and daring escapes, incredulous romances, and entertaining footnotes. Have I mentioned I'm a sucker for footnotes? Anyway, the bottom line is a resounding thumbs up for this book - it's most certainly worth the read, and I know I'll be continuing to devour the rest of the books in this storyline. Seeing as how I'm nearly out of Dresden File books, I think these will serve nicely to break up other more serious fantasy.